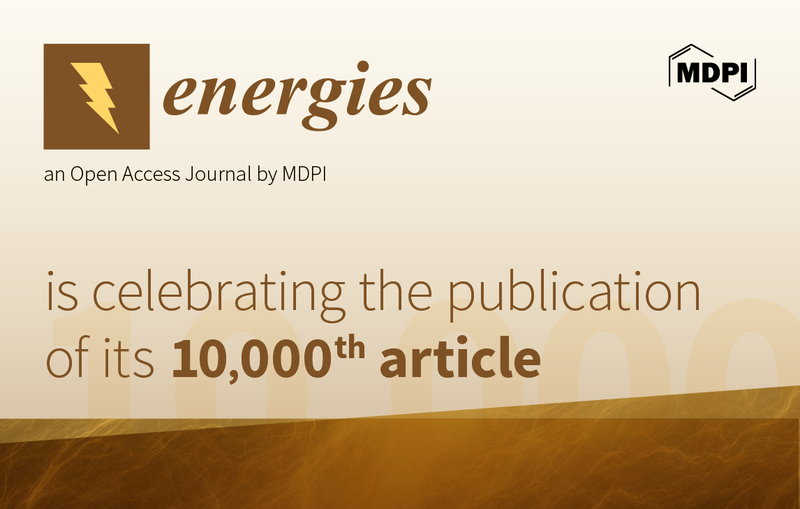 Energies (ISSN 1996-1073; CODEN: ENERGA) is a peer-reviewed open access journal of related scientific research, technology development, engineering, and the studies in policy and management and is published semi-monthly online by MDPI. The European Biomass Industry Association (EUBIA) is affiliated with Energies and their members receive a discount on the article processing charges. High visibility: indexed by the Science Citation Index Expanded (Web of Science), Ei Compendex, Scopus and other databases. Rapid publication: manuscripts are peer-reviewed and a first decision provided to authors approximately 13.4 days after submission; acceptance to publication is undertaken in 5.6 days (median values for papers published in this journal in the second half of 2018). Testimonials: See what our authors say about Energies. From both global and local perspectives, there are strong reasons to promote energy efficiency. These reasons have prompted leaders in the European Union (EU) and countries of the Middle East and North Africa (MENA) to adopt policies to move their citizenry toward more [...] Read more. The Kalina cycle (KC) has been considered one of the most efficient systems for harvesting low grade heat since its proposal and various modifications have been proposed. Recently, Kalina based power and cooling cogeneration cycles (KPCCCs) have attracted much attention and many studies [...] Read more. Since energy efficiency and energy improvement are viewed as two of the most important keys of sustainable management, research on energy has become popular and captured much more attention. The current paper aimed to measure the energy efficiency of 25 countries with carbon [...] Read more. T-type transmission lines have been increasingly used in distribution networks because ofthe distributed generation integration, but inaccurate line parameters will cause significant error in the results of most existing fault location algorithms for this kind of line. In order to improve the [...] Read more. Replacement of part of the coal in the coking blend with lignin would be an attractive solution to reduce greenhouse gas emissions from blast furnace (BF) iron making and for obtaining additional value for lignin utilization. In this research, both non-pyrolyzed and pyrolyzed [...] Read more. Since building-integrated photovoltaic (BIPV) modules are typically installed during, not after, the construction phase, BIPVs have a profound impact compared to conventional building-applied photovoltaics on the electrical installation and construction planning of a building. As the cost of BIPV modules decreases over time, [...] Read more. In the present work, we analyze the influence of the designer’s choice of values for the human metabolic index (met) and insulation by clothing (clo) that can be selected within the ISO 7730 for the calculation of the energy demand of buildings. To [...] Read more. Capable of aggregating multiple energy resources, the energy service company (ESCO) has been regarded as a promising alternative for improving power system flexibility and facilitate the consumption of renewable resources in the energy market. However, the issues have become significantly more serious related [...] Read more. This paper develops an approach for two-day-ahead global horizontal irradiance (GHI) forecast using the naïve Bayes classifier (NB). Based on publicly available weather forecasting information about temperature, relative humidity, dew point, and sky coverage, they are used as a training set in NB [...] Read more. Characterization of pore throat size distribution (PTSD) in tight sandstones is of substantial significance for tight sandstone reservoirs evaluation. High-pressure mercury intrusion (HPMI) and nuclear magnetic resonance (NMR) are the effective methods for characterizing PTSD of reservoirs. NMR T2 spectra is usually [...] Read more. The economic dispatch problem (EDP) is a significant class of optimization issues in the power system, which works on minimizing the total cost when generating a certain amount of power. A novel distributed approach for EDP is proposed in this paper. The presented [...] Read more. The paper deals with a power charger capable of quick simultaneous charging of several unevenly discharged batteries. The charger is designed for use in conjunction with a recently developed power-assist wheelchair composed of two armrest modules associated with wheels—each with its own motor, [...] Read more. Electric vehicles (EVs) are recognized as promising options, not only for the decarbonization of urban areas and greening of the transportation sector, but also for increasing power system flexibility through demand-side management. Large-scale uncoordinated charging of EVs can impose negative impacts on the [...] Read more. This paper presents a comparative study of differences in energy consumption while applying 2004 and 2014 releases of the CEN/TR 13201 standard for lighting designs. Street lighting optimal design and its optimization is discussed. To provide a reliable comparison, optimal designs for a [...] Read more. After long-term operation, the material loss due to slurry erosion often leads to significant changes in the impeller geometry. This change can, in turn, affect the flow characteristics and the erosion mechanism in a centrifugal pump. To investigate this matter, we consider two [...] Read more. The aim of this study was to provide more effective use of straw for energy production by co-firing wheat straw pellets with solid fuels (wood, peat pellets) under additional electric control of the combustion characteristics at thermo-chemical conversion of fuel mixtures. Effects of [...] Read more. End-users are more active because of demand response programs and the penetration of distributed energy resources in the bottom-layer of the power systems. This paper presents a virtual organization of agents of the power distribution grid for local energy trade. An iterative algorithm [...] Read more. Electrical power system forecasting has been a main focus for researchers who want to improve the effectiveness of a power station. Although some traditional models have been proved suitable for short-term electric load forecasting, its nature of ignoring the significance of parameter optimization [...] Read more. During the development of unconventional reservoirs with high sand production rate and fine silt content such as heavy oil and hydrate reservoirs, silt sand blockage problem is a serious issue. A two-stage gravel-packing sand control technique is applied to solve the silt sand [...] Read more.